With this new promo, Sprint switchers can get up to 50 percent off the price of Sprint’s Family Share Pack plan. All that you have to do to get the deal is switch from Sprint, Boost Mobile, or Virgin Mobile to MetroPCS. 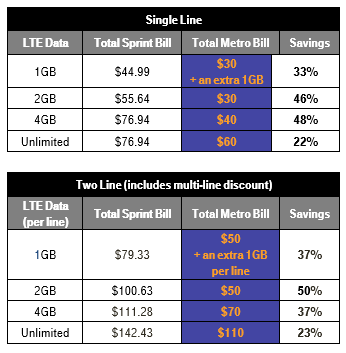 Below you can see charts comparing the prices between Sprint and MetroPCS. Sprint switchers can also get a $50 rebate on a new smartphone, which can net you a free device like the LG Leon LTE or Samsung Core Prime. If you’d prefer something else, you can put that $50 toward a different phone that MetroPCS sells. The rebate will be instant for the first two lines that you switch, but it’ll become a mail-in rebate when you add more than two lines. 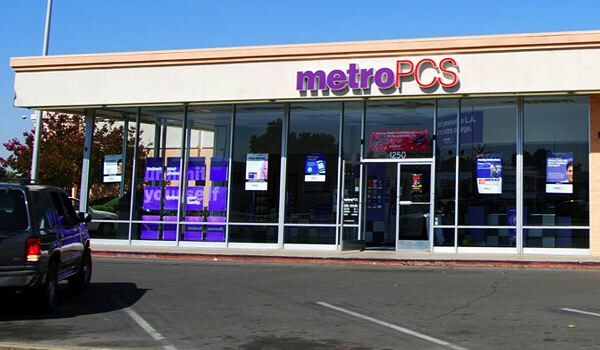 Finally, MetroPCS is offering a deal to its existing customers. Folks on a $50 or $60 plan can add a line with 5GB of LTE data for $30 per month. These promos will launch in MetroPCS stores on January 21, and they’ll be available for a limited time. The savings offered by MetroPCS’s switcher offer will vary depending on which plan you end up selecting, but if you’ve been thinking about jumping ship from Sprint or one of its prepaid subsidiaries, this looks like a good time to do it. It’s also worth noting that with Metro’s plans, goodies like mobile hotspot and Data Maximizer are included, and you’ll also get Music Unlimited if you sign up for a plan that’s $40 or more. Can you expand on that info? I wasn’t aware that there was an issue. Thanks! the 4th line free promotion is ending, you are correct. $120 was never the price. $120 was the price after the promotion…so yes, that would make it the price. whatever dude/maam, promotions end. i dont know whats confusing you. Why quietly? They said it was only temporary…. It did say for a limited time, but in the fine print of this one I didn’t see an end date. Why do you say this?? Two reasons really. The first is because it’s ironic to me that they bring this out just as they drop a promotion at the parent company. The second is because this site should probably make mention of it. As well as the $30 a month 100 minute 5GB “Walmart” plan for new users. The only thing I see now is if it’s true the prices what about the lifeline competition arena? Assurance Wireless once run by Virgin Mobile, now apparently Sprint has a deal going on, in almost all states. Here in california you can a free ZTE smartphone 0 cost for unlimited text, talk and free 500mgbs! With add able 500mgbs at $5 or $10 for 1g! The phone bill is $0 a month plus not to much it has Wi-Fi calling and Wi-Fi capable! Come on Metro PCS beat Assurance Wireless! Only one problem with that argument. You have to qualify to get that deal. It’s a government benefit program. Assurance is being paid by the government and therefore by everyone else. Qualifications: Enrollment in this government benefit program is available to consumers who qualify based on federal or state-specific eligibility criteria. You may qualify if you are on certain public assistance programs, like Medi-Cal or Supplemental Nutrition Assistance Program (SNAP). You can also qualify based on your household income. the fine print is a catch. I just would love that Metro competes in this field of lifeline. I have scan through all T-Mobile brands or partners nothing is out for lifeline plans. ( I don’t blame TMUS to have left the lifeline arena their is serious competition) I know everything has an argument in everything no one is truly happy with all things, that’s way you are either rich enjoy the hell out of things that you got or your hell of poor enjoy the little things that lifeline government goodies gives to people like me. Maybe I should become a switcher, I don’t feel like been loyal to T-Mobile anymore. Binge On, expensive single line plans and all the BS are making me change my mind. lol binge on is making you leave t-mobile? good luck out there. I was talking about loyalty, and becoming a switcher to get the offers, so if I do leave I could also comeback. As a thought, you can always suspend your T-mobile line temporary…. try Metro PCS, if it works continue service. If not, restore your service with T-mobile. You could go one step further and call up T-Mobile and talk to their loyalty reps. Just ask a customer service rep and they’ll get you over to one. I do that from time to time and have always ended up with a great deal through them. That too. I was reading about the special choices the other day. Thanks for the reminder. Suspending a line simply blocks service unless you’re on military leave. It does not discontinue billing. Good deals for existing customers as well! An unlimited plan at 60.00 is impossible to beat. That’s pretty sad when the subsidiary is the one fighting the competition, good luck with the big boys Sprint. At least Metro does loyalty, unlike T-Mobile which gives new customer only offers at times. It seems clear from OP’s post that they are aware of it. No need to be rude. Wow you’re a special case, I guess you don’t know the definition of subsidiary. Except ETFEIP reimbursement (which wouldnt apply), I’m not aware of a single promotion that excluded existing customers, so I’m going to have to call BS on your comment. There’s been exclusive deals for current customers only? News to me. Take it as you want as I’m not going to go through the archives to find you specifics, but it has happened. I’m mainly taking a jab at prior promos on hardware/plans that would require a new line of service, I can’t think of them doing it recently. By the same token I don’t actively track Metro news, so this may have been the norm for them always I’ve just never seen it highlighted. I also found distasteful the numerous Apple/Samsung promos, with no love for other OEMs, but that’s a whole other topic. While I’d have to check and see on the promos issue, I do wholeheartedly agree with you regarding the love for Apple or Samsung and no one else. I’m a Windows user, but it’s not just Windows that gets the back burner treatment. I can’t remember the last time I’ve seen a promotion for a new HTC. After 90 days of continuous service, you can get the new customer price on a new phone. All in all it is not a bad deal. I hear complaints about the lack of high end, flagship phones but that is not Metro’s demographic. There is a good choice of midrange phones. I have the LG G Stylo and it is a fantastic phone at only 149.00. If you don’t care about a status symbol phone and want lots of data, Metro cannot be beat. If you are referring to the recent promos tailored to attract Sprint, Att, and Verizon customers over the holidays….You are incorrect in that T-Mobile did not offer current customers a deal. T-Mobile is offering unlimited data for 3 months that goes from December through February. It’s a great offer for existing customers. No I wasn’t referring to that as that’s for switching. And the data is for Binge On customers, not everyone per se. that’s not correct either. you should stop commenting tbh. And you should comment with substance apparently. I stand by my original post. I have the 3 month unlimited LTE, and I’m not a Binge On customer, the 3 month offer is for everyone….. It doesn’t show up on your account, if that’s what confuses you, cross your 1 or 2 GB limit and you will still have LTE as per TMO rep. Interesting, considering the TMO rep said opposite of that, and I still have LTE after crossing my normal 2.5GB limit….1080p according to YouTube stats. Maybe I’m lucky lol. Either way even if were at a lower resolution a 3 month offer is pretty good. My point was that T-Mobile doesn’t have to directly compete with Sprint anymore, their subsidiary can handle them on their own. Isn’t this just Metro’s regular pricing? I’m not seeing a deal here. You get like an extra GB over the regular Metro plans and a $50 credit towards a phone, which may not be compatible with the promotional free phones Metro is offering to switchers, I don’t know. The unlimited plan is the same $60 as in the current plan.